Sydney Shop Girl: Toddler Proofing SSG Manor. A Work In Progress. A blog reader recently asked if I wouldn't mind putting together a few of my thoughts and experiences with toddler proofing SSG Manor. This post is a summary of what I've done to the house so far but what would probably be more helpful to my reader is if any of you with a bit more experience wouldn't mind adding your tricks and tips to the comments section of this post. Hard hitting, considered blog posts are always best planned out with a bit of chocolate in one hand. In my case, it's been chocolate coated Scotch Finger biscuits. From behind the doors of the toddler proofed pantry. I know it would've been much easier if I'd just gotten something out of the fruit basket but where's the challenge in that? These click open locks are available at quite a few stores around town - I've seen them at both Big W and Kmart. They retail for around $10 per set and usually come in packs of three. No screws or adhesive are required and to release the lock, all you need to do is click on the button. I've got a set of these locks on the shoe cupboard, the under sink bathroom cupboards and most of the others in the kitchen. More later on why I haven't locked all of mine in the kitchen. A good tip I've always remembered when trying to toddler proof your house is to look at your domestic situation from down low, You'd be amazed at just how many potentially dangerous things look so interesting and reachable. Power point locks were probably the first thing we put around the house - Ikea do multi packs with a 'key' with which you can unlock them. There was a time when all that tugged at my heart strings were plaintive looks from behind the bars. 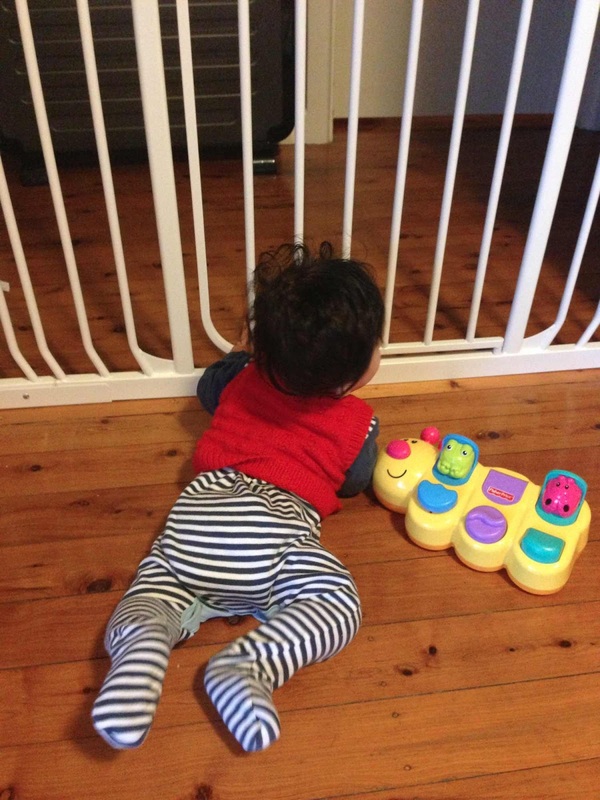 These days, those bars get a firm rattling if Toddler SSG happens to be on the wrong side of the fence. Our house has an open living area that adjoins the entry hall to one side and the kitchen and dining area on the other. Two baby gates effectively block off Toddler SSG's area from these busy thoroughfares. We have the metre high gates from Dreambaby. Toddler SSG was never one for play pens so though the gates are pricy, they have been a good investment for us as they were put up pretty much from the moment he learned to crawl. There isn't much furniture left in the lounge room and that's made it easier to keep this area safe for Toddler SSG and also to keep tidy. There's a lounge, a couple of side tables (near the gates so that I can drop things off as I come and go and a soft sofa made out of some mattresses and a back rest. It works well for our purposes. So long as I have a spot where I can have a lie down close but not too close to the action of a toddler tantrum or a new experiment with furniture climbing, I'm happy. The one other thing I couldn't get rid of was the entertainment unit because our television couldn't be wall mounted. The Good Guys and many other places sell TV straps which help prevent flat screens from being pulled down over the heads of curious toddlers. The set I have cost around $35 and screws into the unit but straps onto the television. Fishpond.com.au was where I found these stick on cupboard locks. They undo like little buttons. I have a larger version of the lock on a folding door near the kitchen. Height has also been my friend. Any ledge that's way above toddler height is the best place to stow things like remote controls. Ever since I discovered Toddler SSG's ability to fossick through the bedside tables and take things from them and then hide them around the house, I've saved myself a few panic attacks by hanging door and car keys from hooks set up high behind the front door. I'm still trying to figure out how to get my sunnies to hand off the hooks as well. Back to the kitchen. It's managed to entertain Toddler SSG more than any one toy I've bought him. It's been one of those ironies of life that he's learned his vital motor skills from the contents of the kitchen cupboards as opposed to the dozens of wooden educational toys I've bought him. I did mention that I've only locked half the cupboards in the kitchen. My reason being that I wanted to give Toddler SSG some freedom here to allow me to get on and do what I have to do. The drawers he can get to are filled with unbreakable but noisy bits and pieces. He empties and I pack up after him. I've lost count of how many times we've gone through this routine already today. Our bathroom features a bath you need to climb into. My mother tells me that it won't be long before Toddler SSG will make a go of climbing into it. Until I see it for myself, I'm in denial. I do have this alligator shower mat from Ikea laid down though. The bathroom bin will always be a sore point between Toddler SSG and I. What is it with used dental floss and cotton squares? And old adult toothbrushes when you won't even let me use your one to brush your teeth? I found this bin with a acrew down lid at my local discount store today and I'm hoping the manoeuvring required to open the lid will put him off rummaging through its contents. This isn't strictly a safety tip, more of a creative diversion. To make up for all the interesting rooms of the house being devoid of practically anything interesting at toddler height, I've been stockpiling empty cartons and plastic containers which I leave on shelves and on tops of chairs so that Toddler SSG has reasonably safe but 'rewarding' things to pull down. It's working about half of the time so far. I'm sure there's heaps of situations I've missed out. If you have any more suggestions, please leave a comment. Lanelle, thank you so much for the tip. Wall painting, I can't wait. so Cute, this made me smile. You are a great mumma. 2nd the suggestion for Crayola. "Hard hitting, considered blog posts are always best planned out with a bit of chocolate in one hand. " Nice statement. Anyway thanks you for giving us idea.